Enter the text to be found and the replacement text in the appropriate fields. Then, if this is the first use of MFR, identify the directory where the other project documents/files are found in the Search Folder: field. If you want the Replace text to match the case of the Find text, select Match Case of Find Text. 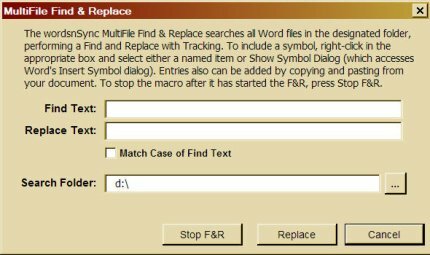 Next click Replace and the macro will search for the Find text and replace it with the Replace text in both the current document/file and in the documents/files in the designated Search Folder. You do not need to specifically turn on tracking in the documents/files — MFR automatically turns tracking on (if it is off); no change is made without tracking on. 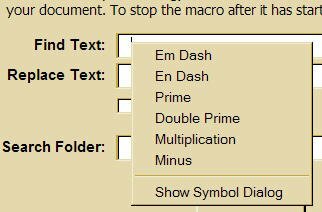 What About Symbols & Special Characters? Searching for and replacing with symbols and special characters — whether by themselves or as part of a word or phrase — is easy with MFR. Right click in the appropriate field (Find Text: or Replace Text:) and you will see a menu as shown below. You can choose one of the named symbols of access Word&apos;s Symbol dialog and select the symbol.